Made of stainless steel material covered with ABS rubber painting,effectively prevents it damaging the bike frame,long lasting durable. 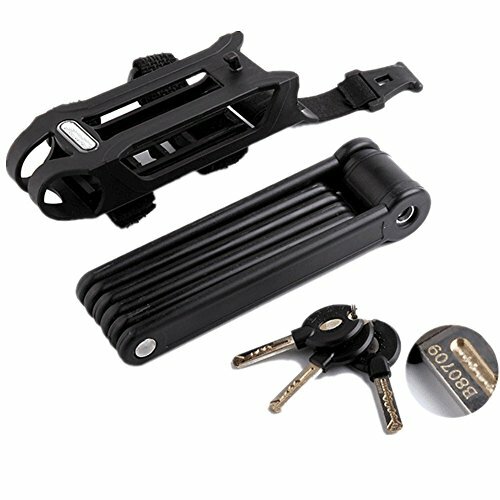 Foldable bicycle lock with 6-joint design,reduce space,convenient to install and carry around,fit for any bike. Using the advanced rotary riveting technology to reduce the joints gap and remain tight,supply The Maximum Power/Cutting Against. Sided recess key and C level lock mechanism prevents against stolen codes and theft. If you have any questions about this product by Agile-shop, contact us by completing and submitting the form below. If you are looking for a specif part number, please include it with your message.